The Transart Foundation for Art and Anthropology is now open in Houston. 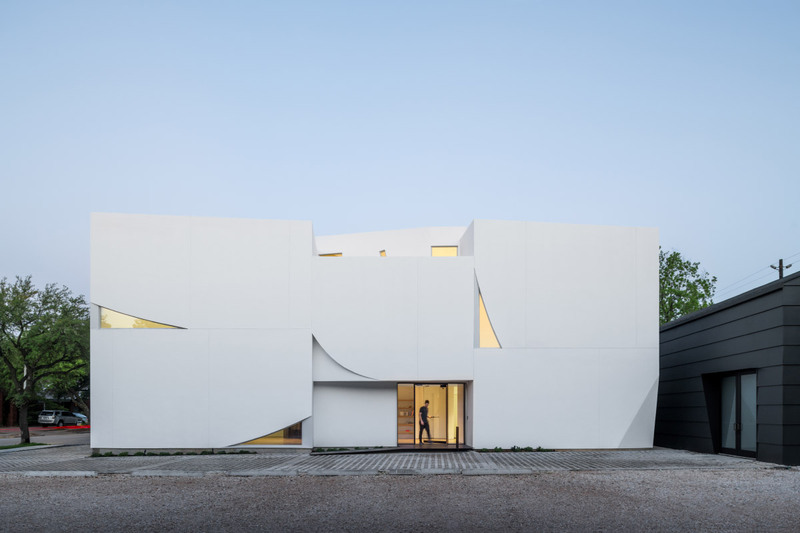 The art center, designed by New York and Houston-based SCHAUM/SHIEH, uses its sculpted stucco facade to strategically funnel light to the gallery space within. Transart is actually broken in two buildings; a 3,000-square-foot gallery and library, and the adjacent 1,200-square-foot studio and living quarters. The foundation was envisioned as a space for experimental art, performances, and lectures that cross the divide between art and anthropology. A large “living room” in the gallery building is broken into two exhibition spaces by a staircase-slash-library in the center that serves as a circulation core. The front-facing space is naturally lit and will be used for more traditional shows, while the dimly-lit back section will be used for digital pieces and performances that require precise lighting. The circulation core flows upwards into a second-floor salon that looks down on the spaces below, which is also accessible through a rounded acrylic-and-steel elevator. Visitors can also find a small room for mediation or one-on-one meetings on the second floor. The third floor’s core holds an administrative office, roof deck, and accompanying garden. "We introduced some playful moments into the otherwise taut plan," said SCHAUM/SHIEH in a statement. "There is a sink lathed out of a tree salvaged from Hurricane Harvey; a sculpted, cave-like nook tucked into the wall off the seminar area; and a galvanized steel beam is used as a bathroom countertop." The main building was framed with heavy timber like a “Dutch barn,” according to SCHAUM/SHIEH, with the white stucco facade curving around the building’s bones, akin to a billowing cloth. The thick timber walls were reinforced with closed-cell insulation, and combined with the swooping window cuts that restrict sunlight, the entire building was able to be passively cooled. The secondary building, a single-story standalone studio and living space for visiting artists and scholars, was created by renovating an existing photography studio. SCHAUM/SHIEH wrapped the building in cement planks and topped it with a new metal roof, creating an auxiliary space a stone’s throw from the main art center. SCHAUM/SHIEH is a small studio formed in 2010 in a joint collaboration between Rosalyne Shieh and Troy Schaum. They operate out of Houston and New York City, and the studio has been recognized for its built and unrealized projects, including by the AIA New York as part of its New Practices New York competition. The Transart Foundation can be found in Houston's museum district at 1412 West Alabama Street and was founded by artist, writer, and independent curator Surpik Angelini, a contemporary of John Cage and Gordon Matta Clark. Commemorating history’s most infamous mass genocide, the Dallas Holocaust Museum/Center for Education and Tolerance in the West End of downtown Dallas is relocating to a new home directly across the street. 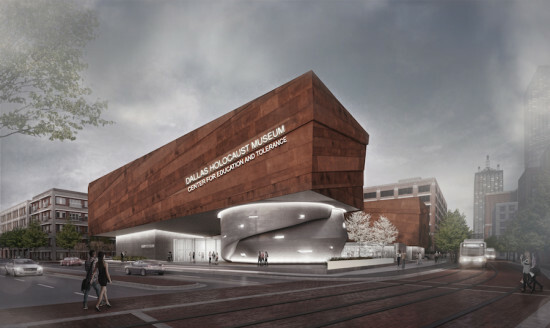 Soon to occupy a land plot hedged by Ross Avenue, Houston St. and the Dallas Area Rapid Translight light-rail tracks, the new museum will boast roomier dimensions than its current 6,000 square feet of exhibition space, providing much-needed leeway for growth and updating of exhibitions. Detailed plans and project costs are hitherto hush-hush, with fundraising still in the pipeline. “It’s too early to commit to an ultimate cost or size, except that it would be substantially larger,” CEO Mary Pat Higgins told The Dallas Morning News. Early renderings bode a concrete and weathered steel structure vastly more design-minded than the current humdrum brick building, where the museum was founded in 1984 by recently deceased concentration camp survivor Mike Jacobs. He had spoken and written widely about his deleterious ordeal. Featuring high ceilings and floor-to-ceiling windows in the lobby area, the new U-shaped museum will be built around a courtyard designated as a “reflective area.” The exhibition space will be the first to go up, with the remainder of the building to be built around it. Michael Berenbaum, former director of the U.S. Holocaust Museum in Washington, D.C. has a stake in plans for the new facility, with his firm, the Berenbaum Group, having already completed the initial stage of exhibition design. The exterior, meanwhile, will be the handiwork of Dallas-based architecture firm Omniplan, which was selected to design the facility following an architecture competition held by the museum. “Given all that is happening in the world today and the constant and destructive force of hatred and prejudice, we are more convinced than ever that North Texas needs this museum,” the Dallas Holocaust Museum said in a statement.